Seberang Perai, Penang – Some 422 pre-schoolers, together with 115 teachers from schools across Seberang Perai spent two Saturdays learning about protecting the environment through the 8R philosophy of Rethink, Refuse, Reduce, Reuse, Repair, Re-gift, Recover and Recycle, in a fun and interactive way, at the first ever 8R Roadshow in the district. Co-organised by Fraser & Neave Holdings Bhd (F&NHB) and the Seberang Perai Municipal Council (MPSP), the 8R Roadshow aimed at generating awareness of the 8R concept amongst the young children as well as their teachers and parents so that they will better understand how waste can be recycled or disposed of properly. Supported by Tetra Pak (Malaysia) Sdn. Bhd. and the Penang State Education Department, the Roadshow inspired the students to unlock their creativity and discover imaginative ways to create new items from recyclable materials. Launched by Yang Berhormat Tuan Phee Boon Poh, Penang State Exco for Environment, Welfare and Caring Society on March 2, 2019 at SJK (C) Kwang Hwa in Butterworth, the 8R Roadshow was part of Kempen Kitar Semula F&N & MPSP 2019, held for the third time this year to nurture students to take ownership and responsibility for environmental conservation at a young age by imbuing them with good recycling habits. Speaking at the launch, Cariessa Goh, Corporate Affairs Manager, F&NHB said that the Group was honoured to have been offered the opportunity to not only collaborate with MPSP in the school recycling campaign for the third time but also in the maiden 8R Roadshow which showcased the Council’s trust and confidence in F&NHB to co-organise programmes that spark children’s love and curiosity for the environment so that they will grow up to become the next generation of environmentalists. Yang Berhormat Tuan Phee Boon Poh, Penang State Exco for Environment, Welfare and Caring Society (fifth from left); Cariessa Goh, Corporate Affairs Manager, F&NHB (fourth from left); and representatives from the Seberang Perai Municipal Council (MPSP) and SJK (C) Kwang Hwa in Butterworth giving the thumbs up following the launch of the 8R Roadshow. “Children in their early childhood are full of curiosity for the world. Hence, instilling the 8R concept in them at such a young age can teach them to respect and appreciate the planet, and discover the tools they need to ensure the long-term sustainability of our environment for generations to come. “The 8R Roadshow is filled with exciting activities that educate the children on the importance of environmental conservation which can stimulate the children’s hunger to explore new knowledge and experiences about taking care of the world that we live in. We are confident that the roadshow can help enhance the level of awareness and understanding of applying 8R in everyday life, amongst the children, teachers and parents. Teaching the children about their surroundings can be enjoyable and entertaining if we take advantage of their curiosity and provide them with endless learning opportunities to help them become more aware of how their every action can impact Mother Nature and its inhabitants,” Goh added. The 8R Roadshow consisted of two full-day sessions held on two Saturdays on March 2, 2019 and March 9, 2019 respectively, to enable the students and their teachers to acquire skills and knowledge of good recycling habits beyond the classroom. Following the overwhelming response to the 8R Roadshow on March 2, 2019 for the Northern and Central districts, 280 students and 24 teachers from the Southern district, converged at SJK (C) Keng Koon in Butterworth on March 9, 2019 to attend the second leg of the Roadshow. The Roadshow began with an exhilarating storytelling session that spurred the children’s imagination and stimulated their curiosity about the 8R philosophy and how they can apply what they learned in their daily lives. The children later had a delightful time trying their hands at a myriad of educational and entertaining games such as jigsaw puzzles and card games to test the kids’ memory at different booths as well as an eco-based snake and ladder game at the Tetra Pak Malaysia counter. Shan Poornam Metals that specialises in converting e-waste into raw materials also set up a booth to explain to the attendees on how e-waste can be recycled into useful items for various industries such as the car production sector. Additionally, the local community from Kampung Kepala Gajah in Simpang Ampat displayed beautifully-made decorative and everyday items from upcycled materials. A local professional wildlife photographer, Jamil Mat Isa also participated in the Roadshow by exhibiting his photos of 11 species of kingfishers found in Malaysia to create awareness of the importance of conserving the environment to prevent wildlife extinction. Attendees also partook in an upcycling workshop that teaches them to create usable and decorative items from recyclables. 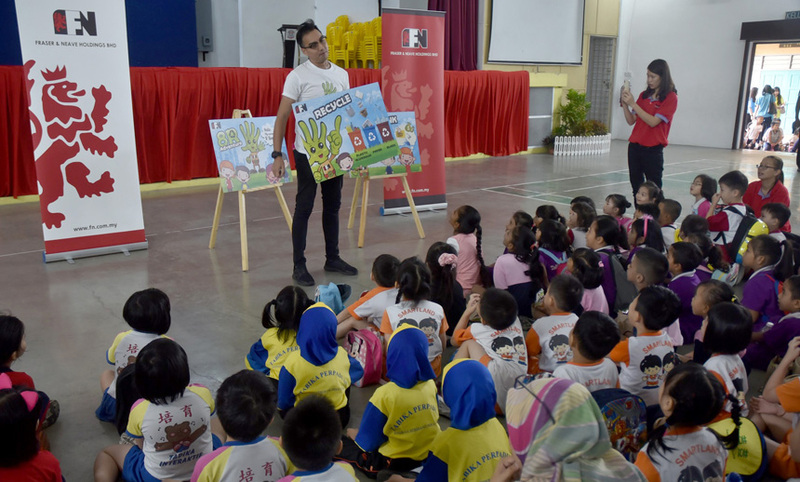 According to Maggie Tan, Principal of Tan Education, the 8R Roadshow complemented the pre-school’s existing recycling programme that encourages its students to practise recycling in their daily lives. “We have been inculcating good recycling habits amongst our students and they are excited about exploring new experiences to enrich their learning journey. Besides the lively games, the kids truly enjoyed the upcycling workshop as they had the opportunity to learn something new which was creating innovative products from recyclables. The activity definitely helps to sharpen their creative thinking and inspire them to come up with bright ideas to invent ingenious items,” she said. Annis Syazwani, a teacher at Tadika Kaliber Murni commended the 8R Roadshow because it offered the children with an avenue to gain new knowledge and feed their inquisitive minds as they continue to learn the joy of recycling. “We have instilled in the students a basic knowledge of recycling through initiatives such as placing recycling bins at our pre-school and conducting quizzes on recycling and incentivise them with gifts. However, this is the first time that the kids got the opportunity to go outside the classroom and gain first-hand experience on the 8R concept. They were really excited about the upcycling workshop and posed a lot of questions about the activity as well as other information they obtained from the Roadshow. It was a wonderful session for them to observe for themselves on how we can adopt 8R in our lives,” said Annis. Meanwhile, Chandrika Devi, who accompanied her six-year-old daughter to the 8R Roadshow said that her family practised recycling at home so that her children are aware of environmental issues at a young age. “I am glad that I attended the Roadshow with my daughter as it gave a glimpse into a plethora of activities that we can do based on the 8R concept. The activities particularly the storytelling session were excellent in getting the kids to be actively involved in learning about 8R and to better understand how they can play a role in taking care of the earth, and share their newfound knowledge with their friends as well as family members,” she said. Goh hoped that the 8R Roadshow would inspire the children to do their bit for the environment and intensify their efforts in Kempen Kitar Semula F&N & MPSP 2019 to create a better world for everyone in their journey to become future stewards of the planet.